Thank you for your ongoing patience concerning the chute clogging issue on HSS724A, HSS928A, and HSS1332A snow blowers. We apologize for the frustration, and again, we appreciate your patience as we have worked to solve this issue. Producing an improved chute design for wet and heavy snow conditions has taken longer than any of us wanted. We would like to give you a preview of the new chute. A larger U-shape opening has been incorporated into the chute. Our extensive testing shows this solves the abnormal clogging issue. As soon as the new chutes are available, American Honda will provide servicing dealers with the information needed to order and install the new chutes. We anticipate release in early October. This repair will not be a recall – recalls are only for safety-related issues. However, please be assured, the repair will be available under warranty if you have experienced this issue. As we stated previously, only a very small number of snow blowers actually experienced this issue – mostly in the New England area. The original snow blower chute seems to clog more easily than expected under certain wet and heavy snow conditions. The new chute design does not improve performance outside of these conditions. For this reason, if you have not previously had clogging issues, you do not need to replace your chute. We would like to note that all snow blowers will clog under certain severe conditions – that’s normal for all snow blower manufacturers. 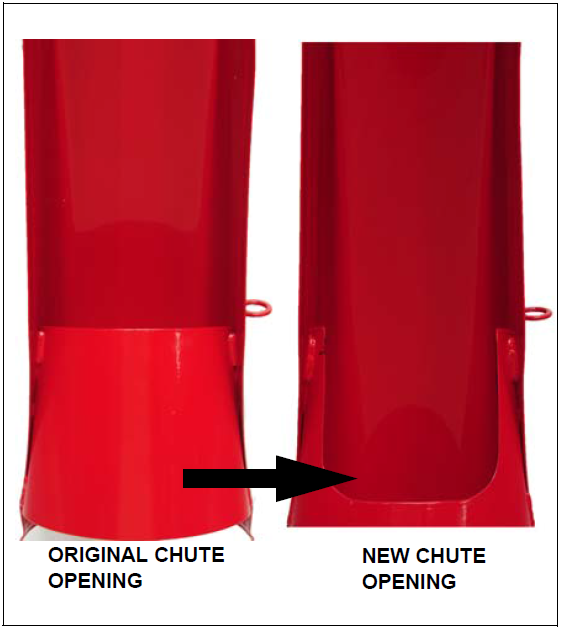 This new chute will address abnormal clogging issues. It may still clog under severe conditions, but that should occur much less frequently. If your snow blower has experienced this issue, you should contact your local dealer in early October. Installation of the new chute will need to be performed by your dealer and will be covered by warranty. If you have questions or concerns regarding your snow blower, or need help finding a local dealer near you, please contact the Honda Customer Relations Office at 770-497-6400 or visit powerequipment.honda.com. Again, we apologize for the frustration this may have caused. Thank you for your patience. My dealer told me with the new chutes, the work light will be covered with snow when the chute is pointed in that direction. A quick additional update on [email protected] Unfortunately he is not back on the forums yet. We hope he is able to return soon. Please continue to direct queries to our Customer Relations team for the fastest response! Thank you for your understanding. Thank you for the update, it's good to get some official info. To avoid assumptions, if a machine is out of warranty, the owner would have to pay for the new chute, even if they are experiencing clogging? I would like to ask Honda the following simple question(s). Will the update be a no charge if the snow blowers 3-year warranty has lapsed? If NO, would it be at no cost if we were to make it known to our dealer that we want the upgrade now before our initial 3-year warranty laps? Would we need to provide an official Honda bulletin number while making the request for service with our dealer? Also, if there be a time limit (beyond the 3- year warranty) for having the upgrade completed, what would it be? "However, please be assured, the repair will be available under warranty if you have experienced this issue"
Any time limit that would force us to send our snow blower to the dealer this winter (service can often take weeks) would not be acceptable. Last edited by Bob_S; 09-13-2018 at 01:43 PM. The attached photos are helpful. While I haven't experienced issues with my machine in Calgary, it is nice to know the fix is so simple and a DIY for those of us that wish to do it anyways. I know Honda took some unpleasant comments from members here, so I appreciate you keeping your cool. Just knowing the fix is simple is reassuring in case we do get the problematic wet stuff others get on the east coast. I certainly plan to keep my HSS724 ACTD for a long time and have a deposit on a second single stage 720 as soon as they arrive in Calgary soon. Honda HSS724ACTD, HS520 and HS720CC. "Perfection is an insult to the Gods." Cut the bloody thing off, ski wax the chute and be done with it. what is so hard about that??? anything in the path of the snow stream will create friction and melt water. 1. Cover the light with a warmed up wide piece of roll up kiddee sled to make a shroud and glue it on the housing with gorilla glue or super glue. 2. Use the rest of the kiddee sled heating it up on the chute to form it and then glue it to the chute if you do not want to use stainless steel elevator bolts. The previous model did not have any of this and it worked well from what I have gathered. So, after extensive research, Honda came up with a fix that someone on this forum has done at least 6 months ago. I hope the Honda R&D team didn't have to spend a great deal of overtime copying the proposed fix. If Honda acts in "good faith" they should extend the warranty for this repair as it took a couple years to address the problem.